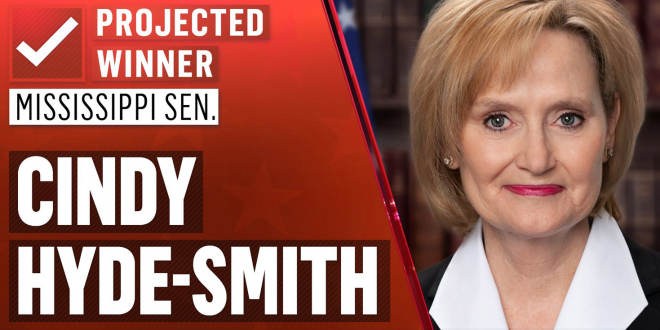 MISSISSIPPI: Cindy Hyde-Smith Wins Senate Runoff - Joe.My.God. Republican Sen. Cindy Hyde-Smith will win Mississippi’s Senate election, holding a GOP seat despite comments that stoked racial tensions in the state and sparked backlash from donors, NBC News projects. The GOP senator will defeat Democratic former Agriculture Secretary Mike Espy in the special election runoff, the final 2018 congressional race. Hyde-Smith will serve the remainder of GOP Sen. Thad Cochran’s term through 2020. She was appointed to succeed the ailing lawmaker earlier this year. Hyde-Smith’s victory secures a 53-47 majority for Senate Republicans in the next Congress, which starts in January. Espy, who served as a U.S. representative from Mississippi and Agriculture secretary under President Bill Clinton, failed to overcome the state’s conservative leanings.